evolve over time and are often adapted to a particular collaborator or project. Gene Ha has been working in the medium since the early 1990s. Fans admire him both for his draughtmanship, for the detail he brings to his backgrounds and environment, and for the emotional resonance he provides his characters. It is the latter for which writer Brad Meltzer begged to have Gene hired as the artist for “Walls,” the story in Justice League of America #11. “I knew we needed him for issue 11. Emotion — true emotion — is the hardest thing to draw. [The story] only works if the emotion is right.” In the story, which won the 2008 Eisner Award for Best Single Issue, the characters Red Arrow and Vixen are trapped under the rubble of a building (it is an homage to the classic stories “The Final Chapter” in Amazing Spider-Man #33 and “Situation: Hopeless” in Secret Wars #4). Throughout the issue, the panels decrease in size as the tension increases, and Gene’s focus on character is placed firmly in the spotlight. BRYAN GALATIS: I’ve heard you say that working with great writers is of primary importance for you. Was Brad Meltzer a writer with whom you’d been interested in working? GENE HA: Honestly, I haven’t read a lot of novels or superhero comics for the last few years. So I knew of Brad but I hadn’t read much of his stuff. I did have Eddie Berganza’s assurance he was brilliant, and Eddie has excellent judgment. I started reading Brad’s JLA run after I got the assignment. He was building up his story like a novel over several issues. There’s a strong parallel with the storytelling on my favorite TV show, The Wire. You get a huge payoff if you pay attention. Also, he had some fun showing the less glamorous side of the job. I wish he had even more room to tell the story. He’s got an amazing storytelling mind. He thinks visually. He writes like somebody who’s been drawing his own stories for years, like Dave Sim or Darwyn Cooke. I can’t think of another non-drawing writer who can think like that. BRYAN: Do you start off with thumbnails or rough sketches? What size are these usually? GENE: My initial thumbnails are done in the margins of the script. The script sketches are all under 2” tall. I make sketches of individual panels and of the blank panels on the page. 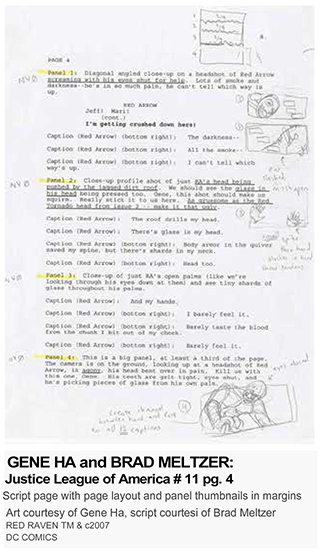 I used to go directly from the script margin thumbnails to the 10”x15” Bristol page. I began to change my process after talking to Barry Kitson about how he works. He made tiny pencil roughs with all the blacks spotted. 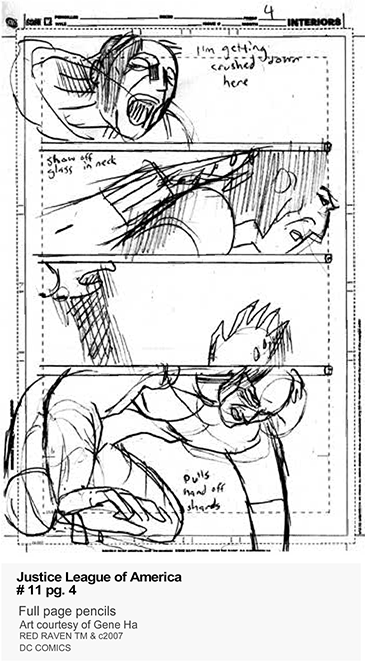 His roughs are as tight as most artists’ finished pencils. I created my current process after I got hold of scanners and color printers that can handle 11”x17” paper. Theoretically, I can make a 2” tall sketch, scan it at 2250 dpi, and then print it out 15” tall at 300 dpi in non-photo blue. BRYAN GALATIS: Your pencils always look kind of rough to me. You seem to save the fine-tuning for your inks. Is this to save time or to keep from locking you in too much for the inks? I have read that some artists feel like tight pencils take the fun and creativity out of inking. GENE HA: [Top 10 collaborator] Zander Cannon describes my pencils as 3D computer wireframe models. They’re not supposed to look like the finished artwork. They’re indications of where the planes and edges of objects are. Like a 3D rendering program, I figure out the lighting and modeling after that stage. You’re right that I don’t like having too much detail in my pencils. I know I’ll come up with better ideas later so detail is both an annoyance and a waste of time. BRYAN: Does the amount of detail you put in depend on the project? GENE: If the setting is important to the story (such as in Top 10) I usually throw in more detail in the back-ground. I didn’t throw much detail into The Authority because the settings weren’t as important and because my editor Scott Dunbier really wanted to meet the print deadlines. Sorry Scott! The rough pencils are done with two 6.8” tall pages on a single 8.5”x11” sheet. I scan these at 882 dpi and print these as 600 dpi 10” tall bluelines for tight pencils. I scan the tight pencils at 680 dpi and print that as 400 dpi 17” tall finished inks and markers. BRYAN GALATIS: In Brad [Meltzer’s] notes for page four, he asked for “lots of smoke and darkness.” In a guest spot on Brad’s blog (bradmeltzer.com, 18 July ’07), you said that you “mostly used Copic paper on this issue for grainy, dusty effect.” Have you used the combination of that type of paper with “graphite pencil, gray Copic markers, white charcoal pencil and white paint” on previous projects? GENE HA: It’s the only time I’ve used the Copic brand marker paper. I am using Copic markers, pencil, Pitt brush pens and white media for my new Top 10 project. When I initially started using the Copic paper I was disappointed by how the marker ink pooled on the surface after it dried. If you placed another stroke on top it smeared the previous ink. It was oversaturated with ink, like rain drops on a windshield. Generally I wouldn’t want that effect, but it happened to match the setting (trapped in a dusty collapsed building). For scenes outside the building I worked on plain old inkjet paper. It absorbs the marker without bleeding. It’s a trick I learned in my art school days. Marker paper is fine, but I noticed that when I worked on photocopies that the colors were more vivid. BRYAN: Does subject matter often dictate you choice of materials and/or style (such as your use of ink wash on The Forty-Niners)? GENE: Various elements of the comic affect my choice of technique. For The Authority I wanted it to look slick and I needed to work fast. I went with standard Bristol paper and india ink. The Forty-Niners was a period story so I used a muted palette, hinting at Saving Private Ryan and also B&W movies. In modern or futuristic stories I like a smoother and more colorful look. BRYAN GALATIS: I recently read an interview with Jerry Ordway where he talked about using the same photo reference (from a book) for the Golden Age Flash for over 25 years. He said it had helped him keep the character’s look consistent both within the book (drawing the character at different ages) and over time. Have you used photo reference in this way? GENE HA: I do try to use the same model or photo reference for the same character. The big fear isn’t that I’ll make the character change, but that I’ll make all the characters look the same. I hate it when all the characters have the same nose. BRYAN: Do you prefer different models for different characters? GENE: For the broad anatomical and lighting issues I can use almost anyone for reference. It doesn’t need to be a close match. In this case my Red Arrow model was pretty close to what I wanted Speedy to look like. I didn’t send you pics, but my Vixen model was actually Asian! I vaguely based the head on Halle Berry, but that was just from memory. BRYAN: Were you happy with the way “Walls” turned out? How did your fans respond? GENE: I was very happy. I did worry about how fans [would] react. In online reviews reaction was very divided, but generally positive. In person, fans all seemed to like it. That’s not a representative sample. People generally don’t bother coming up to complain. It’s not worth the effort. At cons your pretty [much] only hear from the happy readers. I suppose that gives creators a rose tinted view, even if they start putting out crap. That makes it very important to get feedback from other creators, especially the brutally honest ones.